Glow Crafts – Page 2 – ActiveDark.com – Glowing Ideas! Glow Crafts are a fun family activity suitable for everybody of any age! Here are some ideas and suggestions for fantastic glowing crafts. Glow in the dark crafts are great all year round and especially for festive occasions such as Halloween, Easter and Christmas! Keep checking back for updated glow in the dark craft ideas! Want a simple, cheap and effective way of really brightening up your party or event? Glowing Balloons! Many in the party entertainment industry may have noticed over the last few years that there are now several glow in the dark balloon products on the market. 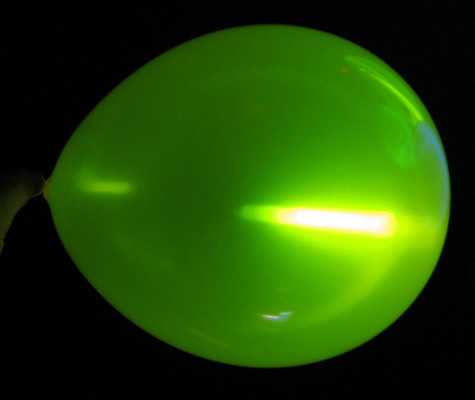 The most common being Flashing LED Balloon Lights that are placed inside of a balloon. These are the most practical if you are looking for a bright flashing balloon light that works in a helium filled balloon. We also experimented with placing some standard and common glow sticks inside balloons. The most eye catching effect was simply from pushing a couple 22 Inch Glow Necklaces or a small handful of 8 Inch Glow Bracelets into a balloon as you are blowing it up to create a spectacular glowing spaghetti like effect inside your balloons. If you are looking for more of a constant central glow, try using a standard 4 Inch Glow Stick or 6 Inch Glow Stick inside of a frosted balloon to create that all-glowing ominous light effect. We also experimented with several brands of miniature glow sticks and surprisingly found that they did not work as well as we thought they would, the glow was very subtle and displaced to the bottom of the balloon. We certainly recommend using the larger sticks and the glow necklaces and bracelets however these will not work in helium balloons due to the weight. If you want to make your floating balloons glow, we recommend Miniature Glow Sticks or the LED Balloon Inserts.